1. 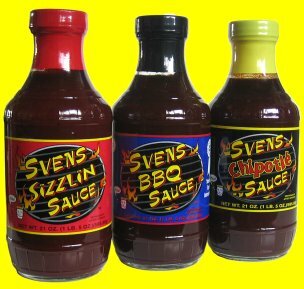 Pour 2 jars of Svens BBQ sauce in the pan. 2. Place ribs in pan, cover all surfaces of meat with BBQ sauce. Rub it in with hands. 3. Pour more Svens BBQ sauce into pan on top of ribs to cover ribs or almost cover ribs. Important: most of the meat should be under the sauce. 4. Cover pan with foil and marinate over night in fridge. 5. Next morning, place in oven on low, ~170 degrees F, and cook 8-10 hours. 6.Just before eating,place ribs on medium temperature grill. Baste one side of ribs,grill fora few minutes until the sauce is thick and sticky. Flip over and do the same to the other side. Don’t over do it! 7.Turn on some background music immediately before eating. It will be so quiet during supper cuz everyone will be devouring ribs. In a medium mixing bowl, beat egg with milk. Mix in the crushed croutons, salt, sugar and spices. Add beef, turkey or pork and onion; mix thoroughly. Shape meat mixture into meatballs the size of walnuts (by dipping your hands in cold water the meatballs won’t stick to your hands). Place meatballs on a rimmed cookie sheet and bake for 8-10 minutes (time will vary by oven).